I want to do something similar with the BitX40. Hopefully I can also modify it to do USB and CW. The case will be the cast aluminum Hammond 1550G. It has a gasket for water resistance. I have used these Hammond cases for numerous projects and they are awesome and very though. 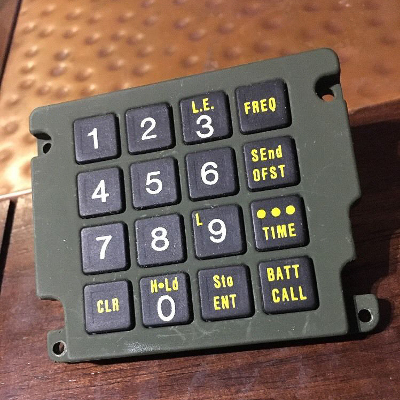 I will also get a U-183/U audio socket to plug in an H-250/U military handset. 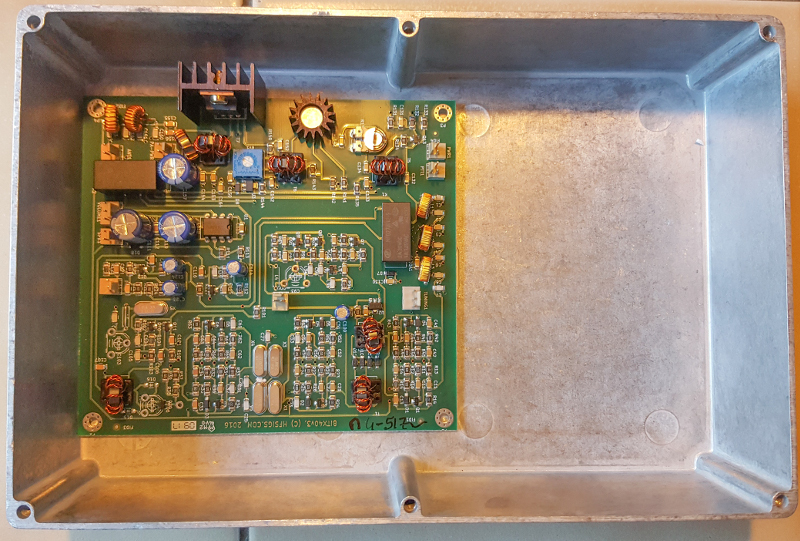 The microphone has an impedance of 150-Ohm, 1KOhm for the speaker, so some modifications will be needed. The difficulty will be to find the pin-out schematic of the keypad and program the Arduino board to update the DDS chip. I want to use direct frequency entry but also up/down scanning of the band. There are enough keys there to do everything, though of course, the markings will be off. 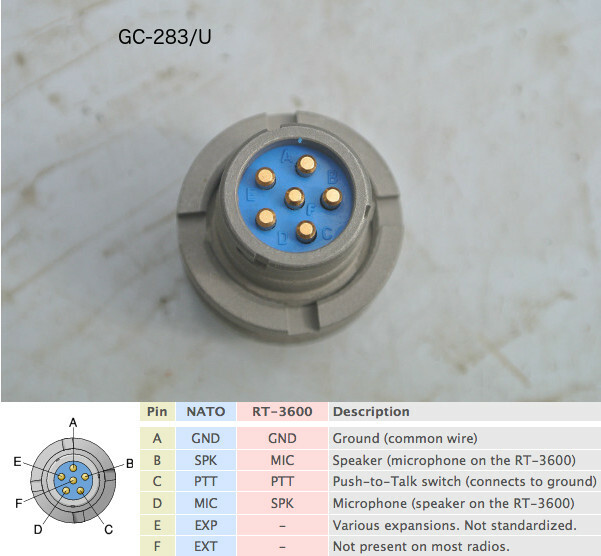 The only connectors on the case will be the BNC antenna socket and U-183/U audio socket. I want to use one pin out of five to turn the radio on so that it will be on when the handset is plugged in. Batteries will be three, four or six 18650 cells. I might add a charging socket but it would have to be a watertight military model, otherwise all my other efforts would be for naught. Now I need to connect an Arduino with a DDS module and the keypad. That won't be easy and neither will be the programming since I have no experience with Arduino and little with C.
What a great project. You get gear customized just the way you want, and you learn a ton in the process. I can help with programming a bit. Set up a GitHub repository of your code so we can work on it together. My first concern will be to connect the eight pins of the keyboard to the Arduino. I just found out the Nano doesn't have a DC input plug so I need another model, no idea which one. Maybe the one that will come with the BitX. The problem is that each time a key is pressed two pins are connected together, from the left-four group to the right-four group. I can only think of having A,B,C,D output 1,2,3,4V respectively, and detect a key press on E,F,G,H, if that's even possible. The extent of my Arduino experience is making the LED blink with a provided sketch... But hey, it's a good opportunity to learn. Hi Gil. Forgive me if this is something you already know. I couldn't quite tell. 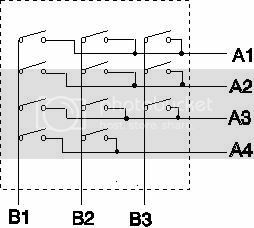 Your keyboard has the standard row/column scanned-multiplexed arrangement similar to the schematic below. What's usually done is the 3 "B" pins are connected to Arduino outputs and the 4 "A" pins are connected to inputs. Software will set B1 to a "1" then look for a "1" on the four A pins. Then it will move the "1" to B2 and scan the A pins. Then B3, then back to B1. So it is continually scanning the keyboard when it is idle. When it finds a "1" on an "A" pin the program goes off and does whatever it's supposed to do then goes back and continues the scanning. This is pretty basic stuff for processor programmers. I bet there's routines someone else has done you can download, or I'm sure Rescue9 can help with this. Thanks Bob, simple way to do it! Hammond 1550G cast aluminum case. Thales military speaker microphone RA480/1019. The Thales microphone is an electret type so I won't have to match impedance. It's also watertight! Great stuff Gil, I'm really looking forward to see how this project develops! I got the case today. It looks to be just the right size with room to spare for batteries and the DDS/Arduino combo. on those 'New Family' mil connectors is power. 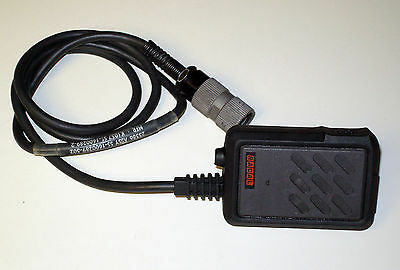 For anything NOT requiring power, like headsets, external key or digital, that 5 pin will work fine as a 'second connector. 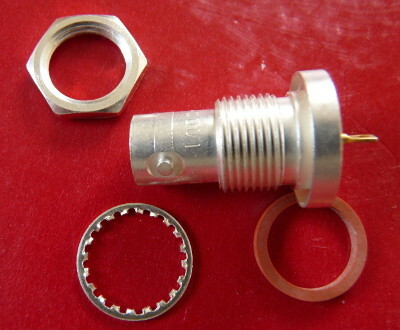 Should you later decide that you NEED a powered connector, it's the same mounting hole diameter and you can replace it in no time. oh I am used to the standard configuration. Your project is making me want to find and finish my 80 meter SURVIVOR. for camping. Your project is making me want to find and finish my 80 meter SURVIVOR. for camping. 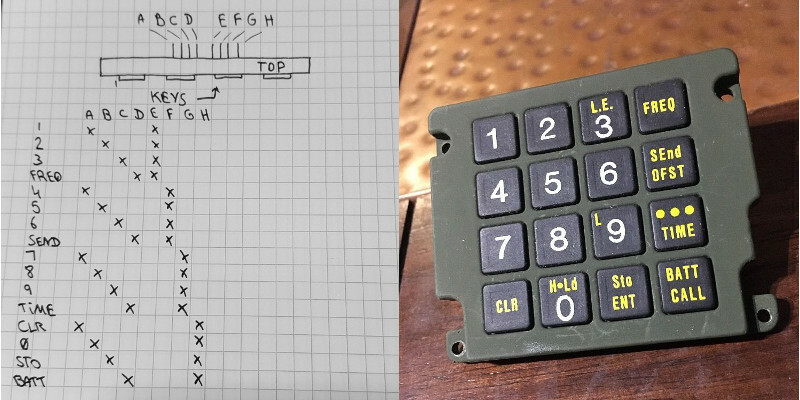 Have you figured out what size arduino you need yet, to accommodate the keypad IO connectivity?